Inking It Up With Cathy: Identifying Your Ink Pad Colors When Open..
Do you ever have this happen to you? 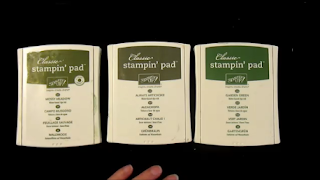 You have several ink pads open at the same time and accidentally stamp in the wrong one because you mistake which one is which color? If you have, take a couple minutes and watch my video for a resolution to this problem. I will show you to tell what color each pad is when they are open. Well, what do you think? Easy, isn't it?